Shrimp, scallops, octopus, mussels can be prepared in dozens of ways. Recipes of seafood dishes can be simple or quite complex. But often they are based on the pre-marinating. The marinade adds a special touch of delicate seafood dishes and makes them even tastier. Before cooking the seafood defrost, dropping for a few minutes in boiling water. So they are better soaked with juice and acquire a more distinct taste. The principle of marinating shrimp, mussels or squid one – in a deep dish mix the liquid-based marinade (wine, oil, fruit juice, soy sauce) and spices. Seafood are placed in the mixture and exposed from 15 minutes to several hours, depending on the recipe. After this training they can fry, simmer or bake on the grill in more complex cooked marinated products do not need. Seafood cocktail in a spicy marinade. Squeeze lemon juice, grate the zest on a fine grater. Chop the parsley, Bay leaves grind into a powder. Put 2 tomatoes in the blender, grind them. Packing defrost the seafood cocktail of shrimp, mussels, squid, scallops and octopus, place in a deep bowl. Drizzle seafood with olive oil, sprinkle with the lemon zest, add the tomato puree, herbs, Bay leaf, salt, pepper and a pinch of nutmeg. Close up of a bowl with a lid and refrigerate for 4 hours. 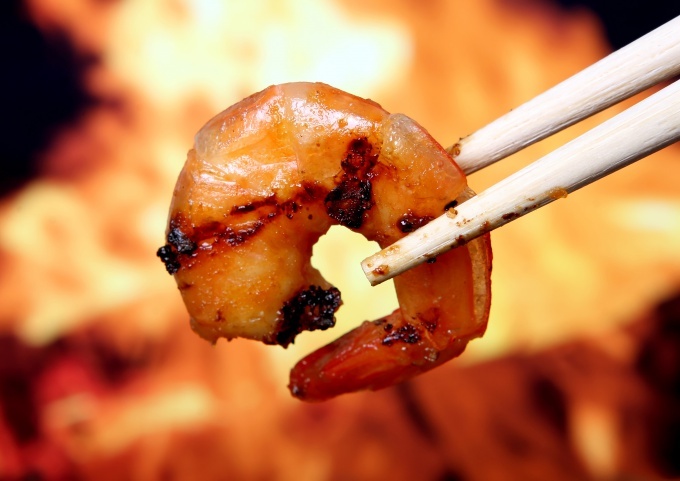 Remove seafood from marinade and fry in hot olive oil. Before serving place on lettuce leaves and drizzle with fresh lemon juice. Mussels in white wine. 500 g cleaned mussels, rinse and place in a bowl. Add salt, pepper and pour a glass of dry white wine. Place the bowl in the cold for 15 minutes. Put the clams in a deep pan along with the marinade and simmer until evaporation of the wine. Ready mussels melkorublenym sprinkle with green onions. Shrimp in soy sauce. 12 prawns defrost, clean, without removing the tails. Place in a deep bowl and pour marinade 4 tablespoons soy sauce 4 tablespoons dry white wine, 2 chopped cloves of garlic, salt and ground black pepper. Marinate for one hour. Prepared shrimp put on the grill and fry on both sides. Serve with a green salad and half a lime.